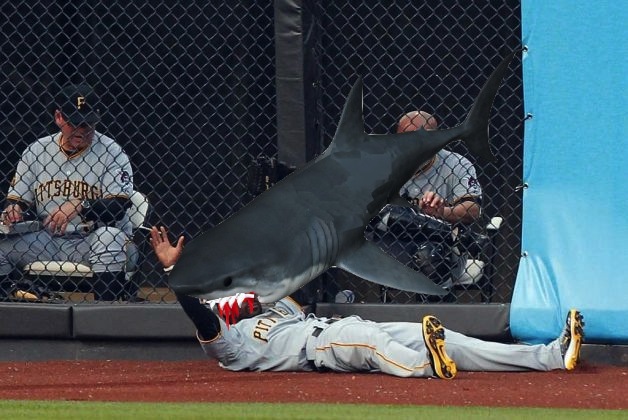 The Sharkadina Blog: "shark shark"
For the second time this week, the Shark-led Nationals went into last nights game against a below average team with a chance to sweep. For the second time, the Nats were unable to seal the deal. You would think that the Shark would be able to tear a seal to shreds. The Nats spanked the Pirates on Wednesday because they somehow managed to keep down Andrew McCutchen. This was partially because of Gio Gonzalez, but more likely because Bo Porter tranquilized McCutchen during batting practice. Sadly, they were unable to do the same thing last night, and McCutchen took advantage, hitting two home runs and robbing The Stag of at least a double in the Nats 5-3 loss. Despite the loss, the game was a lot of fun. On the Metro, I ran into Shark fan Leslie, whom I recognized as a Bernadina fan because she was wearing the very first Shark shirt! She was totally cool and apparently has a great Facebook profile picture of her and the Shark! Another cool part of the game was running into THE FAMOUS 200TH PERSON TO LIKE SHARKADINA ON FACEBOOK. His name is Bijan and he is awesome! See! It was a great game for Sharkadina pride, and a good game for finding new followers. Imagination Stage's own Phil, Ana, KB, and Rachel were chanting for the Shark all over the stadium (or so I am led to believe)! That said, Mick won the award for most dedicated, showing his Shark pride all the way home.